We had fun testing MSI's ludicrous GT80 Titan SLI laptop this time last year, and though the overriding emotion was one of "oh-my-God, they didn't," there was something fun about using a laptop outfitted with as much ammunition as Starkiller Base. But when push comes to shove, does a big, bulky, loud and mega-expensive laptop make sense in today's world? MSI clearly thinks so, as it's back with something that's faster, louder and priced even higher at an eye-watering £3,990. Say hello to the GT80S 6QF Titan SLI. Look familiar? That's because the chassis hasn't changed over the course of the past 12 months. The GT80S remains a behemoth at 456mm x 330mm x 49mm in size, and the hefty weight makes it only marginally more portable than your desktop. 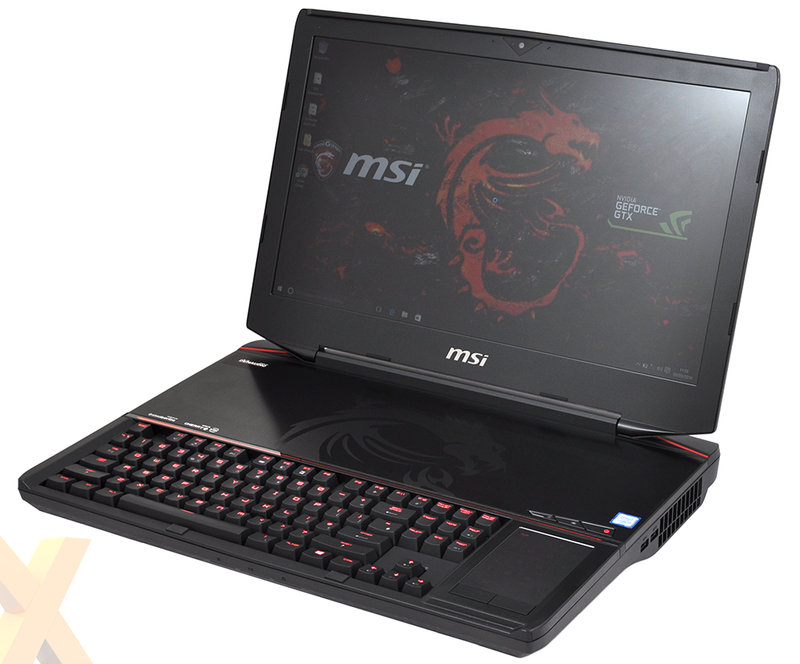 Or, from MSI's point of view, "this monster is merely 4.9cm in thickness and weighs only 4.5kg." It's all a matter of perspective, clearly. GT80S is what's known throughout the industry as a desktop replacement, and though it can of course be moved from one location to another, we suspect it will stay put more often than not. Considering the price tag, build quality and appearance aren't anything to write home about. It's a big slab of plastic interspersed with metal reinforcement and a few red accents. The system's size and weight do however provide a robust feel - drop the GT80S and you'd have to worry about the floor as much as the laptop. Much like last year's model, the 2016 GT80S is all about cramming-in as much hardware as humanly possible. Starting on the outside, we have a Blu-ray writer, audio-out powered by an ESS Sabre HiFi DAC, three USB 3.0 ports, SPDIF-out and headset and microphone jacks all on the laptop's left edge. There's less happening on the right, where you'll find just two USB 3.0 ports alongside a good-sized vent, but there's plenty more around back. This is where MSI provides Killer Gigabit Ethernet, a connector for the large, 330W external power supply, HDMI-out, mini DisplayPort and a so-called SuperPort that permits a Thunderbolt 3 or USB 3.1 connection. Should you prefer to stay largely cable-free, there's WiFi courtesy of a high-end Killer Wireless-AC 1535 adapter. Everything about the GT80S should be forward-looking, but the 18.4in display sadly isn't. MSI is making do with the same 1080p panel (model number SDC4C48) as last year, and while it's nice and large with decent viewing angles and surprisingly accurate colour, you do feel shortchanged when the best part of £4,000 buys you so few pixels. This is a laptop crying-out for a 4K panel. Other unchanged aspects include the 4.1 speaker system - which continues to deliver an audio experience that puts most other laptops to shame - and a unique keyboard and trackpad implementation. 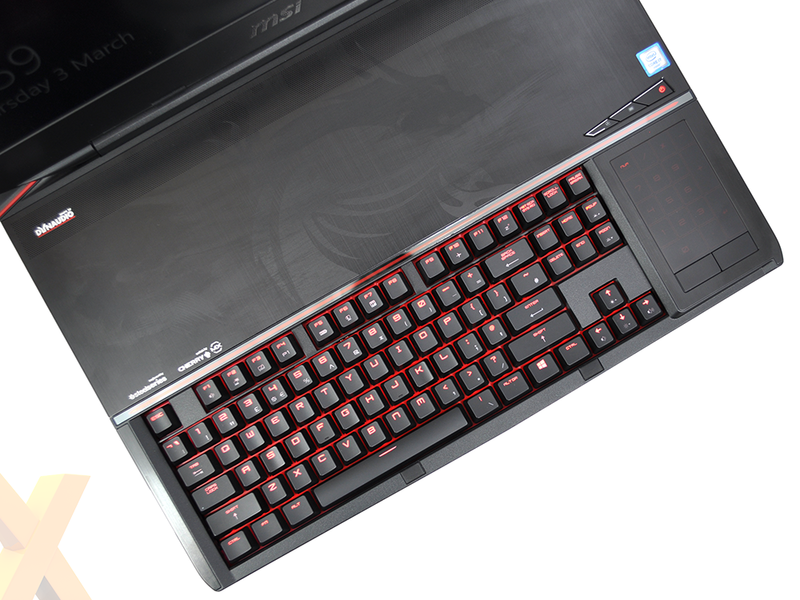 Making full use of the GT80S's size, MSI implements a backlit mechanical keyboard that in practise is rewarding to use. It feels more like a proper desktop peripheral, and by keeping it close to the front edge, it's away from the hot-running components so your hands stay cool during use. What's less impressive is the accompanying trackpad. Shoehorned to the right of the keyboard and doubling as a touchscreen numpad when Num Lock is activated, the trackpad is ultimately too narrow and never feels quite right. Seems as though not a lot has changed, however there are some key upgrades waiting beneath the hood. Cherry-picking its components from the latest-generation crop, MSI has settled on a quad-core Intel Core i7-6920HQ processor and dual Nvidia GeForce GTX 980 GPUs in an SLI configuration. And yes, there's no typo there, we do mean GTX 980 and not GTX 980M, meaning a full-fat desktop implementation, twice. There's an incredible amount of performance on offer, and MSI does a good job of keeping the core components accessible for user upgrades. 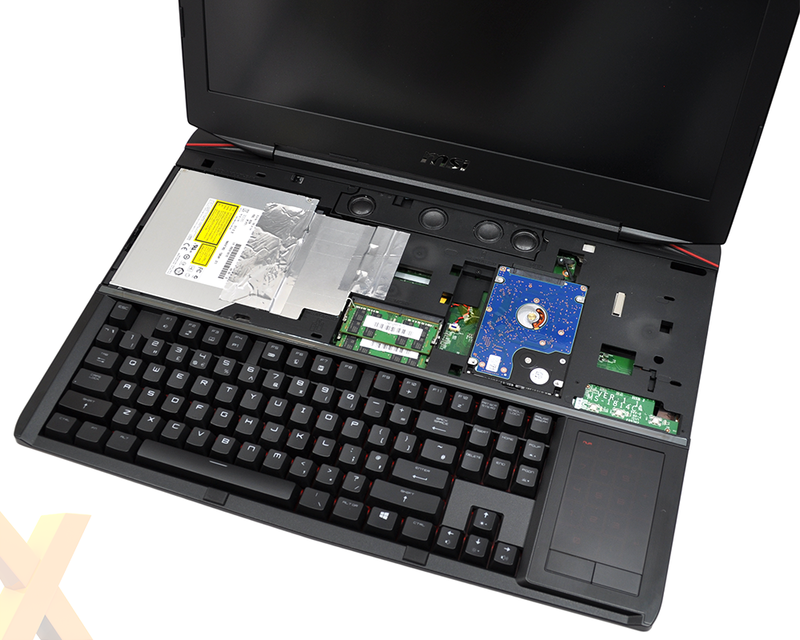 The cover above the keyboard slides off to reveal access to two of the laptop's four memory slots and an array of storage bays. In its default £3,990 specification, the GT80S is pre-loaded with a whopping 64GB (4x16GB) of DDR4 memory, dual 256GB Toshiba NVMe M.2 SSDs in a RAID 0 configuration, and a 1TB hard disk for additional storage. Gamers might be MSI's target audience, but we suspect video editors and multimedia prosumers wouldn't mind on-the-road hardware as potent as this. Flipping the beast over and removing the bottom panel reveals the three processors (Core i7-6920HQ, GTX 980, GTX 980) all hooked-up to two exhaust fans by a maze of heatpipes. It's an elaborate setup, but unfortunately not particularly refined. The fans can be heard at all times, and when you do start gaming, the GT80S becomes awfully loud. You wouldn't expect such hardware to run quietly in a laptop form factor, however noise is a genuine concern - this might be the world's fastest laptop, but there's also a good chance it's the most vocal. Too much power can be detrimental and MSI is very close to going over the line. 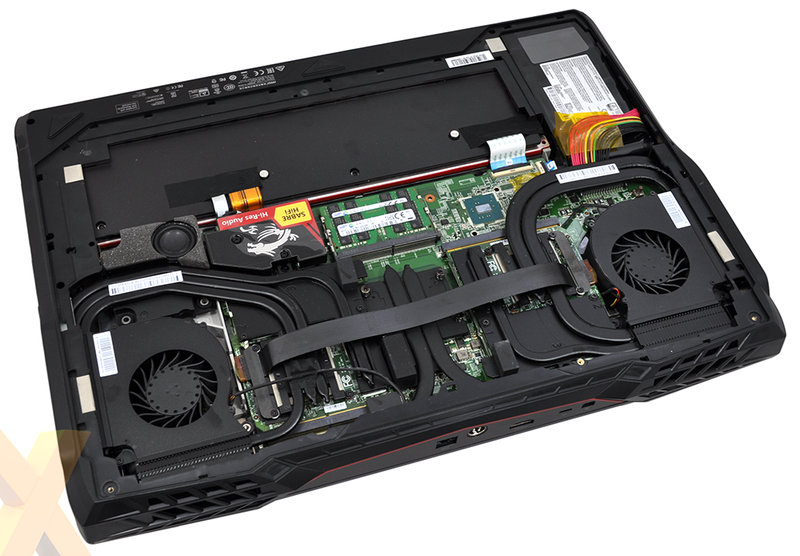 The chosen hardware components chew through the 75W battery in rapid fashion (more on that later), and when gaming we were surprised to find that battery life would slowly decline even with the laptop plugged in. It seems the 330W supply needs help when everything is running full-chat. Madness in the grand scheme of things? Perhaps so, but admit it, you're itching to see some benchmarks, aren't you? Let's get to it.